Two red chairs and two tables were lined up by the curtain at the Gaiety School of Acting’s black box theatre. We, the fourteen students from America, were dressed in our blacks and seated on bright red chairs on the far sides of the stage. Throughout the show, we would rise and return to these seats depending on which actor is in what scene. The full time students of the Gaiety School of Acting were ushered in by our directors Patrick Sutton and Martin Maguire. They gave a brief introduction and Patrick retreated to the light booth to give us our first blackout; the cue for us to start the show. The show started with the entire cast walking in a funeral procession and keening, the ancient Irish tradition of mourning the dead. This was to set the tone for the burial scene from Riders to the Sea by John Millington Synge. The cast rotated and a similar tone was given to a scene from another play by Synge, Deirdre of the Sorrows. Three scenes from Sean O’Casey were performed after what the students called in rehearsal “The Trilogy of Death” (a final scene in the sequence was cut to ensure the showcase was under an hour.) Which in turn were followed by a large section of scenes by Samuel Beckett including Waiting for Godot, Come and Go, Piece of Monologue and Not I. The latter of which was performed by five women holding sheets of paper over their faces revealing only their mouths. The rest of the show consisted of selections from plays of Brian Friel. Faith Healer, Philadelphia Here I Come, and Dancing at Lughnasa were all represented. At the end of the final scene of the night from Dancing at Lughnasa in which an actress threw a massive cloud of flour into the air, turning the black floor an off-white. 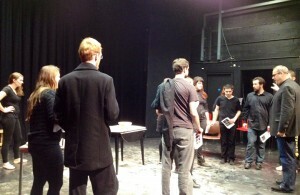 The cast rose from the red seats and tracked their way through the flour to take their bows.